This short book, part of the ‘ANZAC Battles Series’, explores the action of the 3rd Light Horse Brigade on 7th August 1915 when four successive waves of dismounted Light Horsemen charged into a withering maelstrom of Turkish rifle and machine gun fire armed only with bayonets fixed to unloaded rifles, an action immortalised in the 1981 film Gallipoli. The Brigade had landed at Gallipoli towards the end of May 1915 and was almost immediately thrown into action. The men quickly became aware of the realities of trench warfare; the conditions paid no distinction to rank and fighting and disease started to cause the loss of experienced officers and affected the men’s morale. In a portent of things to come the Turks launched their own unsuccessful attack across The Nek on 30th June. 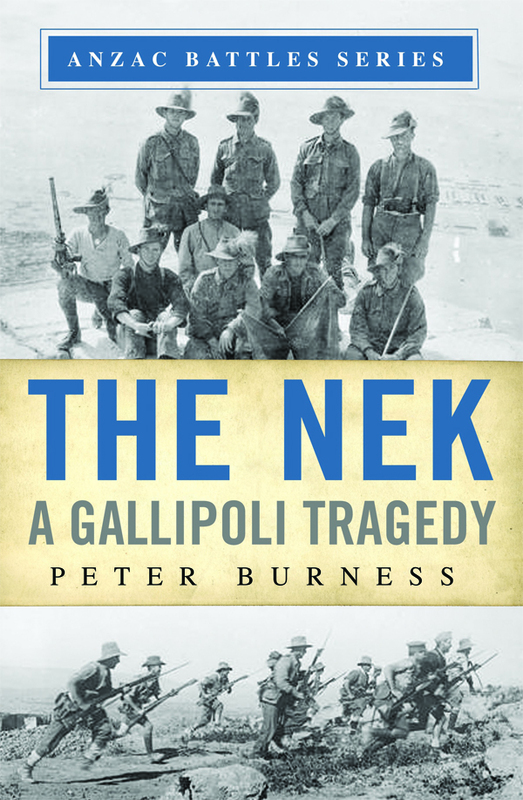 As Burness states, ‘In their attack across The Nek, the Turks had demonstrated, to their great cost, that it was impossible to cross this narrow stretch of ground in the face of machine-guns and massed rife fire.’ With this in mind it seems even more incredulous that the Australians were ordered to undertake the same suicidal task. The ANZAC attack on The Nek was part of a series of interlinked assaults required to take the Sari Bair heights. It relied on surprise but the artillery bombardment warned the Turks an attack was coming. Even more seriously, the bombardment finished seven minutes too early, giving the Turks ample time to man their parapet. This costly error was never fully explained but Burness briefly provides a plausible explanation. Despite failures in other areas of the assault, Birdwood (commander of the ANZAC Corps) still pressed ahead and ordered the attack. The first and second waves were mown down almost instantly as the full weight of Turkish fire was brought to bear on them across just 50 yards of no man’s land; no officers from the first wave survived. After the third line was also cut down, desperate attempts were made to halt the advance of the fourth line, however due to communication difficulties part of the fourth line still went forward. The fact that the troops still advanced knowing full well the fate that had befallen their comrades is testament to both their training and character. A chapter titled ‘Reflection’ provides a measured analysis of who was at fault, with the entire senior command structure facing criticism for the parts they played. Burness deftly examines the strained relationship that existed between the 3rd Light Horse’s Brigadier, Brigade Major, and regimental officers, and the effect that this had on the events that day. Ultimately it was an over-ambitious plan and the Brigadier and Brigade Major were too far removed from the action to make effective decisions. Whether the attack could have succeeded is touched on briefly, but Burness asserts that given the variables involved this was highly unlikely. The book has comprehensive notes, and whilst it lacks a bibliography it is clear that the excellent resources at the Australian War Memorial have been widely consulted. With 400 casualties suffered by the attacking troops thankfully Burness does not lose sight of the ordinary soldiers who were involved, and intertwines their stories into the narrative. Several examples of men who survived the action only to lose their lives later on are given; such was the relentless and indiscriminate nature of the war. Logical and well written, this is an excellent account of the action that day and the personalities involved, balanced by a measured analysis of the reasons for its failure.